Sweet and crunchy dried chips made from the ripe fruit. Jackfruit (Artocarpus heterophyllus or 'nangka' in Indonesian) is originally native to India, but it has spread to all tropical regions around the globe. This largest tree-borne fruit is widely cultivated across Indonesia, where people enjoy the sweet ripe fruit fresh or mixed into desserts. Crunchy, dried jackfruit 'chips' are also a popular snack. Furthermore, Indonesians cook the unripe or 'green' fruit in various traditional curries and stews. 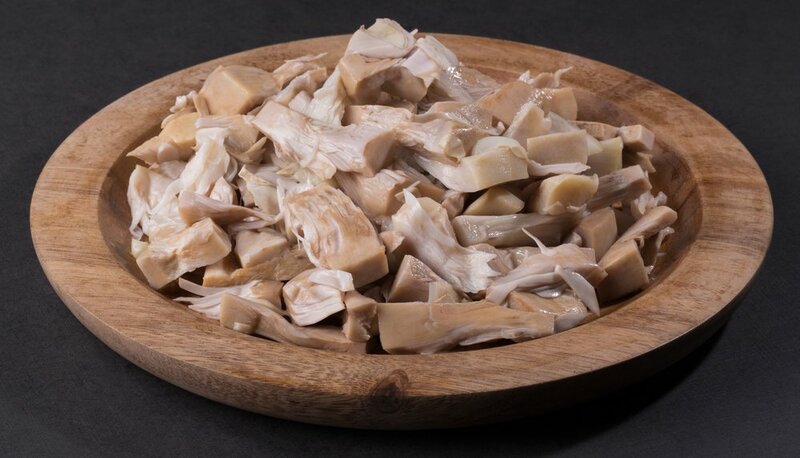 This use of the 'green' or young jackfruit as a cooking ingredient has been gaining exposure and acceptance in the global vegetarian/vegan community as a viable meat substitute, because its cooked texture, mild meat-like taste and nutritional values resemble that of beef. Nutritionally, jackfruit is a great source of vitamins B6, C, A, as well as thiamine, folate and potassium. PMA aims to popularize this amazingly versatile tropical fruit on the foreign market. As with our other offerings, our jackfruit products are certified organic by international certification bodies. We use modern processing technology and machines for autoclave, boiling, canning and pasteurization – in our effort to maximize the preservation of the natural nutritions and flavors, as well as ensuring food safety for our customers. Young jackfruit that has been processed, ready to be canned or packed into pouches. PMA offers three jackfruit products: the green/unripe jackfruit is processed into Organic Young Jackfruit Pouch and the Organic Young Jackfruit Canned; while the ripe fruit becomes the Organic Jackfruit Chips.